Younger Western Europeans – those who are 18 to 29 years old – turn to a different mix of outlets for news than adults ages 50 and older. They tend to rely less on public news organizations and more on newspaper and magazine brands (in any format) than those ages 50 and older. And a substantial portion of younger adults in six of the eight countries studied also name social media or search engine sites as their main new sources, which are much less likely to be named by those in the oldest age group. Adults ages 30 to 49 share some similarities with both the youngest and the oldest age groups – in some cases they name public news organizations at rates similar to those 50 and older, but this age group also names some online sources at rates similar to younger Europeans. Additionally, adults under 30 are less likely to agree on a single main source for news, while those 50 and older are more likely to do so. In most countries, younger Western Europeans are less likely than those ages 50 and older to say that their main source for news is a public news organization. In the southern countries studied – France, Italy and Spain – public news media don’t rank among the top three sources named by younger adults at all.3 In Italy, for example, Rai News is the sixth most named source for those under 30, with just 6% of younger adults naming the public broadcaster, compared with 11% of those ages 30 to 49 and 32% of those 50 years and older. 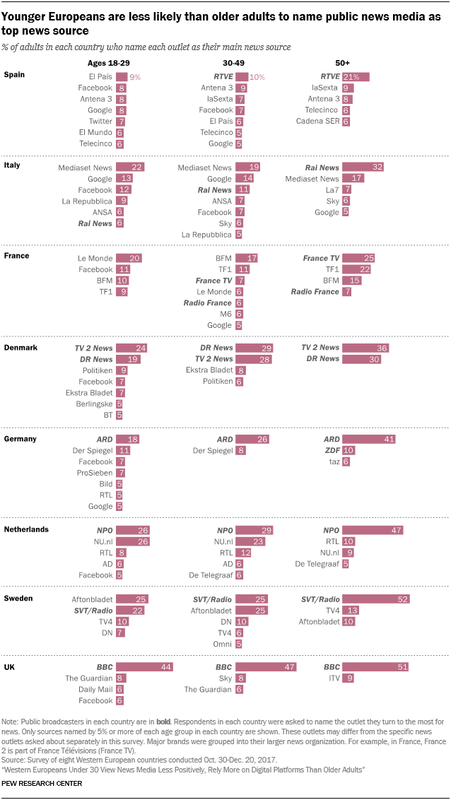 In the rest of the countries surveyed, even though public news organizations do rank among their top three main sources, younger adults don’t name these outlets as frequently as those 50 and older do. In the Netherlands, for example, while almost half of those ages 50 and older (47%) name NPO as their main news source, about a quarter of those ages 18 to 29 (26%) and 29% of those 30 to 49 do so. In Sweden, about half of those ages 50 and older (52%) name SVT/Radio as their main news source, compared with 22% of those ages 18-29 and 25% of those 30-49. The one exception is the UK, where the public news organization, the BBC, is the most named news source across all age groups, cited by at least four-in-ten adults in each age group as their main news source. While younger Europeans are less likely than those 50 and older to use public news media, they are more likely to name a newspaper or magazine brand as their main source for news. A striking example is France, where Le Monde is the most commonly named main news source among those under 30 – 20% name it, compared with 6% of those 30 to 49 and just 2% of those 50 and older. Newspapers are far less common as a primary news source among the oldest age group in all eight countries. Only in one country – Sweden – did adults ages 50 and older name a newspaper (Aftonbladet) at a rate of 5% or more as one of their primary news sources. Adults ages 30 to 49 name newspapers as main sources in some countries but usually at lower rates than those under 30. This preference for specific newspapers by younger Europeans exists even though they are less likely to get news from print platforms – suggesting that their consumption of news is more likely to be through newspaper websites or social media accounts. And while these newspapers sometimes have explicit ideological leanings, younger Europeans across most countries surveyed are more likely to turn to them, even after taking into account that younger people in many countries tend to lean more to the left. Additionally, younger Europeans are more likely than the older age groups to name a social media site as a primary news source: In six of the eight countries studied, 5% or more of adults ages 18 to 29 name Facebook as a primary news source. This is only true in two countries for those ages 30 to 49 and in no countries for those ages 50 and older. In nearly all countries, younger adults are less likely than the oldest age group to agree on one outlet as their primary news source. For example, in Germany, 41% of those 50 and older name ARD, the top source for all age groups, as their main news source, compared to just 18% of those ages 18 to 29. Fragmentation among younger adults is especially evident in Spain, where no outlet is named by more than 9% of younger people as their main news source. Two exceptions are the UK and France. In the UK, large portions of both younger adults (44%) and those 50 and older (51%) concentrate around one outlet – the BBC – as their main news source. In France, no more than a quarter of any age group agrees on a top main news source. Younger and older Europeans also differ in which sources they turn to most. Looking at just the outlets named by 5% or more of each age group, younger adults in all eight countries list at least one outlet that isn’t named by those 50 and older. And in the case of Spain and Denmark, younger adults name five sources that aren’t named by at least 5% of those ages 50 and older. For example, in Denmark, younger adults name Politiken, Facebook, Ekstra Bladet, Berlingske and BT as their main sources for news, while those in the oldest age group do not name any of these.